Brazil was not bluffing last year, when it said that it wanted to disconnect from the United States-controlled internet due to the NSA's obscenely invasive surveillance tactics. The country is about to stretch a cable from the northern city of Fortaleza all the way to Portugal, and they've vowed not to use a single U.S. vendor to do it. At first glance, Brazil's plan to disconnect from the U.S. internet just seemed silly. The country was not happy when news emerged that the NSA's tentacles stretched all the way down to Brazil. And the country was especially not happy when news emerged that the NSA had been spying on the Brazilian government's email for years. But really, what are you gonna do? Brazil made a bunch of bold promises, ranging in severity from forcing companies like Facebook and Google to move their servers inside Brazilian borders, to building a new all-Brazilian email system—which they've already done. But the first actionable opportunity the country was presented with is this transatlantic cable, which had been in the works since 2012 but is only just now seeing construction begin. And with news that the cable plan will not include American vendors, it looks like Brazil is serious; it's investing $185 million on the cable project alone. And not a penny of that sum will go to an American company. 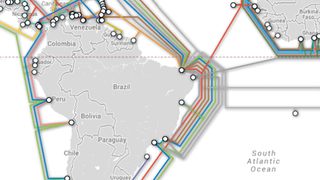 The implications of Brazil distancing itself from the US internet are huge. It's not necessarily a big deal politically, but the economic consequences could be tremendously destructive. Brazil has the seventh largest economy in the world, and it continues to grow. So when Brazil finally does divorce Uncle Sam—assuming things continue at this rate—a huge number of contracts between American companies and Brazil will simply disappear. On the whole, researchers estimate that the United States could lose about $35 billion due to security fears. That's a lot of money.